FIFA bans Luis Suarez for nine international matches and barred him from all football activities for four months. RIO DE JANEIRO: FIFA on Thursday banned Uruguay striker Luis Suarez for nine international matches and barred him from all football activities for four months for biting an Italian opponent. The heaviest punishment ever inflicted on a player at a World Cup finals effectively booted Suarez out of the tournament in shame following his clash with Italy's Giorgio Chiellini on Tuesday. It is the third time that the 27-year-old striker, one of the most brilliant footballers in the world, but also one of the most temperamental, has been banned for biting an opponent. The nine match ban would be effective immediately, ruling him out of Uruguay's World Cup second round match on Saturday against Colombia, FIFA spokeswoman Delia Fischer said. As part of the ban on football activities, Suarez will not be allowed into a stadium for four months. He was also fined 100,000 Swiss francs (82,000 euros/112,000 dollars). FIFA said that Suarez was told of the ban on Thursday. Uruguayan officials had previously insisted there was not enough evidence to take action against Suarez. 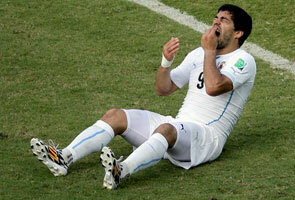 Suarez bit Chiellini during Uruguay's 1-0 win over Italy in World Cup Group D on Tuesday. The referee did not immediately see the incident but FIFA ordered an inquiry straight after the match following protests by Chiellini and as images of the bit spread on the internet. The player had initially shrugged off the incident. "These are just things that happen out on the pitch. It was just the two of us inside the area and he bumped into me with his shoulder," Suarez told Uruguayan television.